I’m hosting next month’s Aspiring Bakers event and the theme is Boozy-licious – just bake or cook anything with at least 1 tablespoon of alcohol (yes any kind of alochol! ), blog about it, and submit your entry to me! Can’t wait to see what you all have cooked up! Leaving the woes aside, let’s come back to this tart! 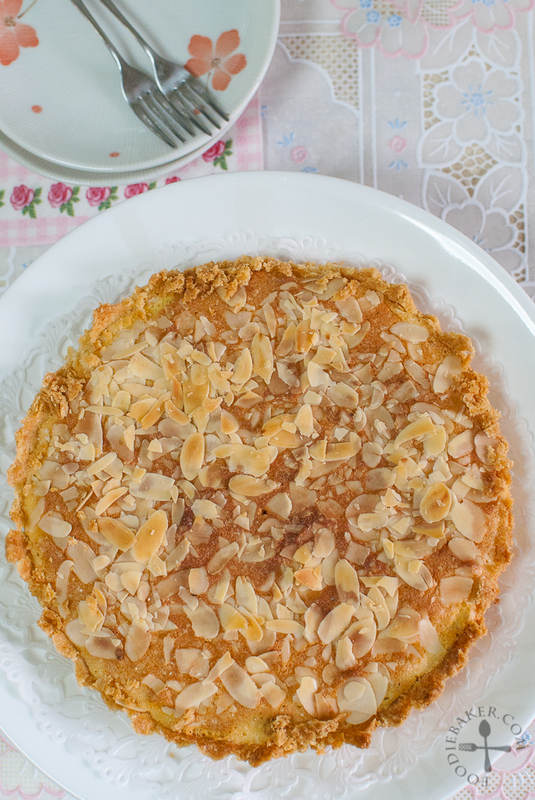 This almond tart from Williams-Sonoma is very interesting – a layer of jam is spread on top of a tart crust then topped with an almond-based filling that bakes up to have a cake-like texture. The soft, cakey texture is contrasted with the crunchy almond slices sprinkled on top as well as the crunchy tart crust. I tried Googling for the history but the weird thing is I find zilch on it! Many Italian almond tarts, also known as Frangipane Tarts, do not have the layer of jam in it. Instead, fruits such as raspberries or cherries are studded into the tart before baking. 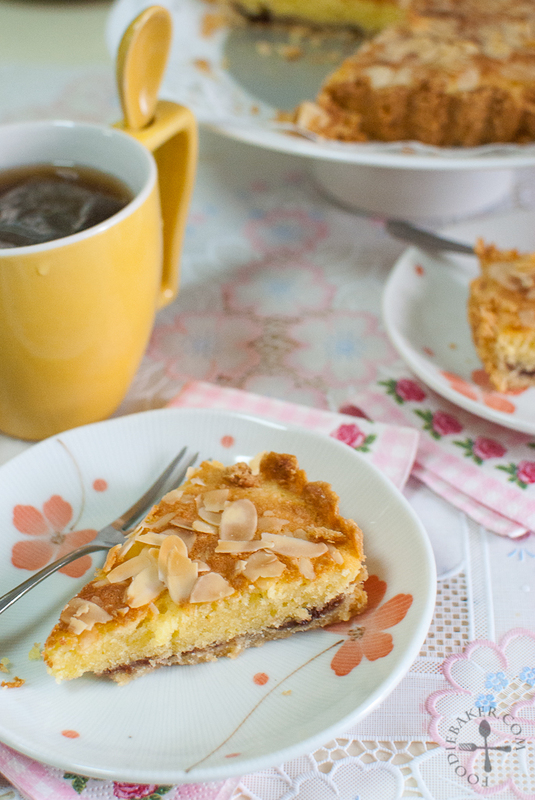 But whether it is English or Italian, this tart is still delicious and great with a cup of hot tea! However, I’m not very satisfied with the tart crust as though it tastes good, it’s pretty hard to handle (gets soft very easily) and it’s pretty crumbly. I’ve also tried making my own almond paste using a recipe I found online and the resulting paste is quite liquidy – perhaps I have used too much egg, but luckily it didn’t affect the final product much. Sugar has also been reduced and I found the resulting sweetness is just right. If you are using a not-so-sweet jam, maybe you can increase the amount of sugar in the tart filling. 1. What is one value that you live by? Contentment. I love the sentence said by Maya Angelou, “We need much less than we think we need”. 2. Who’s your favorite person in the whole wide world? My grandmother – she’s the most patient, tolerant, giving and generous person I’ve ever known. My homemade chicken rice – I can’t believe I made it, one whole chicken and all! 4. What was your first childhood ambition? I don’t remember… I think I had a lot of dream jobs when I was young – doctor, lawyer, teacher, florist etc. 5. What would you do if you had a year of free time? Both! Most of my friends prefer either or, but weirdly I like both! Probably still a potato… potato dishes know no boundary! This question is so funny! 8. Are you more of an introvert or extrovert? I was an extrovert when I was younger, but I found myself to becoming more and more of an introvert these days – weird huh! 10. What’s something about yourself that usually surprises others? To people who don’t know me, they’d be surprised I bake/cook and also I owned a food blog. Probably because very few people are that into baking/cooking these days! A big thank you to Feline for the award and another big thank you to you all for being so encouraging and sweet! 1) Measure the dough incredients. 2) Cut the butter in. 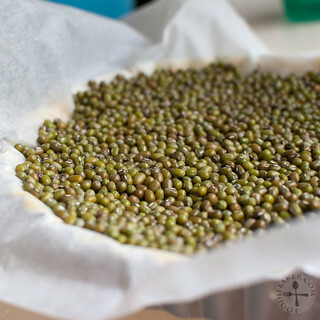 3) Chill then press into tart tin. 4) Par-bake the crust. 5) Combine almond paste ingredients. 6) Blitz together into a paste - a bit too liquid! 7) Measure tart filling ingredients. 8) Beat in the egg. 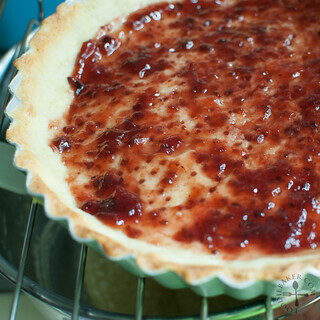 9) Stir in the flour 10) Spread a layer of jam on top of the crust. 11) Spread the tart filling. 12) Sprinkle with almond flakes and bake! This bake is for Bake-Along hosted by Zoe from Bake for Happy Kids, Joyce from Kitchen Flavours and Lena from Her Frozen Wings! And before I go into the recipe, here are all the other bakes by fellow foodies! 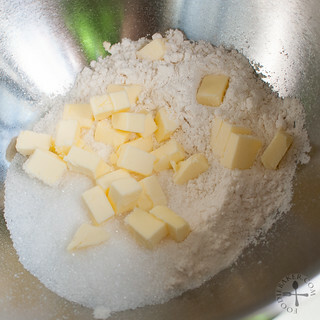 Mix flour, sugar and salt in a medium bowl. 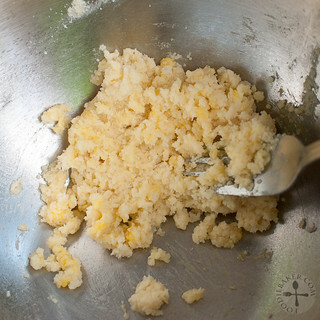 Add in butter and cut with 2 knives or rub it in with your fingertips until the mixture looks like coarse sand. 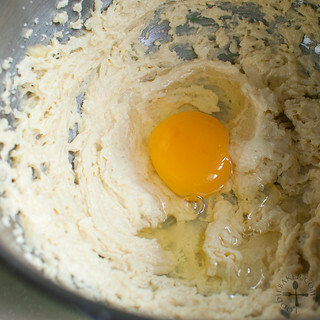 Add in the yolk and ice water and mix until a soft dough forms. Wrap the dough up with a plastic wrap and refrigerate for 30 minutes to rest. Unwrap the dough and working quickly, roll it out with a rolling pin until it is big enough to cover a 7-inch tart pan. Transfer the dough into the tart pan, using your knuckles to gently ease the dough into the pan. If the dough tears, don't worry, use the excess dough to patch it up. Refrigerate for another 30 minutes. Line the dough with a parchment paper and line with plenty of weights (I used green beans). Bake for 15 to 20 minutes in the middle rack (for small ovens) or lower third of the rack (for big ovens) until the sides are pale golden. Remove the weights and parchment paper and bake for another 3 to 5 minutes until the crust is golden. Set aside on a wire rack and let cool. 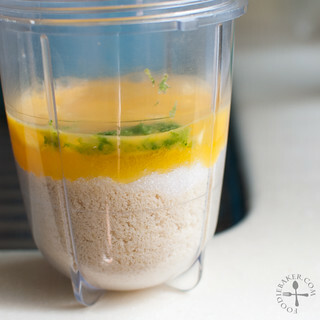 Combine all the ingredients in a food processor and process until a smooth paste is formed. 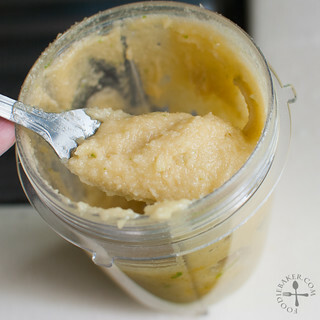 The paste can be made in advance and stored in the refrigerator until you need it - makes about ½ cup. 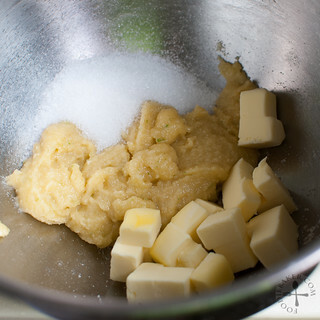 Place the Almond Paste, butter and sugar in a medium mixing bowl. Cream with an electric mixer until light and fluffy. Beat in the egg , followed by flour. 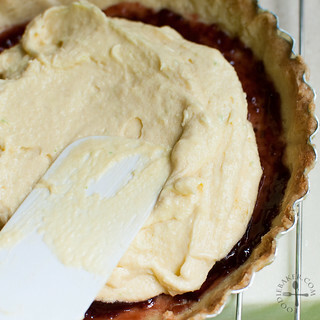 Spread the jam over the cooled tart shell and pour the tart batter over the jam, spreading the batter evenly. 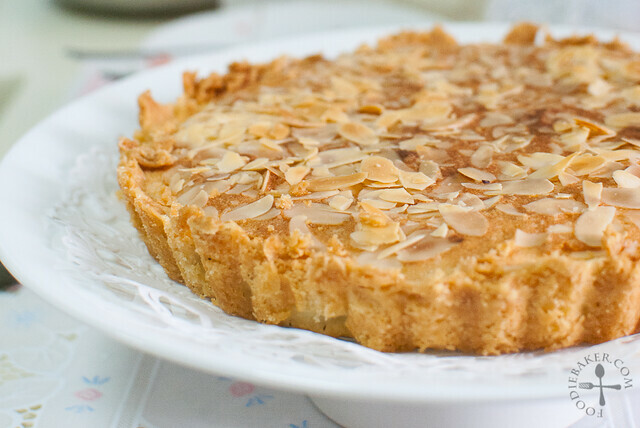 Sprinkle the almond slices all over the tart and bake for 35 to 40 minutes until the top is golden-brown in colour. Serve warm. 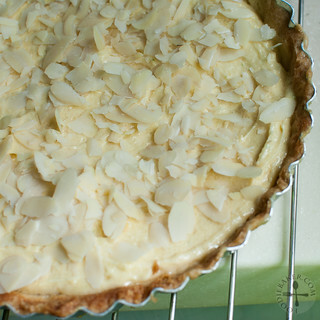 I’m not very fond of the tart crust as it’s quite hard to handle and softens very easily. I think the problem lies with me – so I’ll have to give this tart crust a try again the next time. 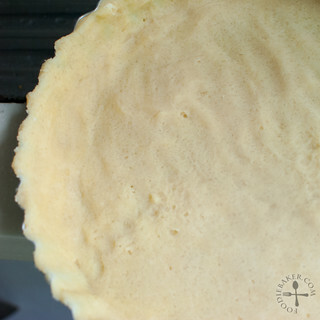 If you have tried this tart crust from the same recipe book, please share with me your experience! Or if you have a favourite tart crust, let me know and I’ll try yours next time. The almond paste is also quite liquidy as I’ve used about 4 teaspoons of beaten egg – I think the almond paste is supposed to look like marzipan – a lot firmer and can be moulded, so I’ve reduced the amount of egg in the recipe. Nonetheless, the almond paste still incorporated well with the remaining ingredients. Hi Jasline. So glad I’d popped into TwoRedBowls as that’s how I found your link again. For some reason I wasn’t getting email updates. So I’ve re subscribed, and added you to Bloglovin’. Yes, this sounds very similar to a Bakewell tart. In fact, there’s a Bakewell pudding made with flaky pastry as well. Which I’ve never had. Anyway, thank you so much for the nomination. And many congrats on yours! 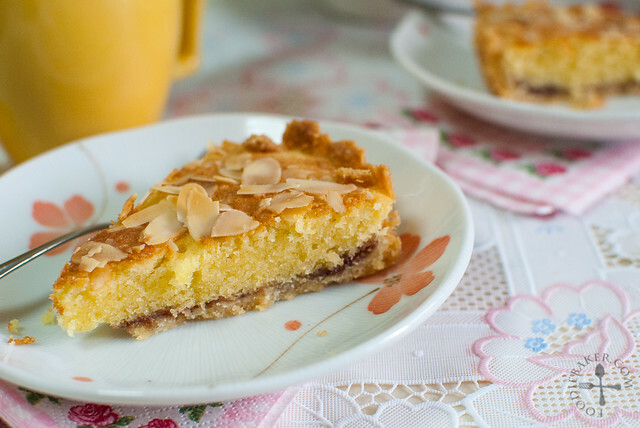 This almond tart sounds simply divine. I love almond paste in literally anything, so a tart made out of predominantly that sounds like my idea of the perfect dessert. And thank you SO MUCH for the Liebster nomination! I truly appreciate it 🙂 Love your blog. 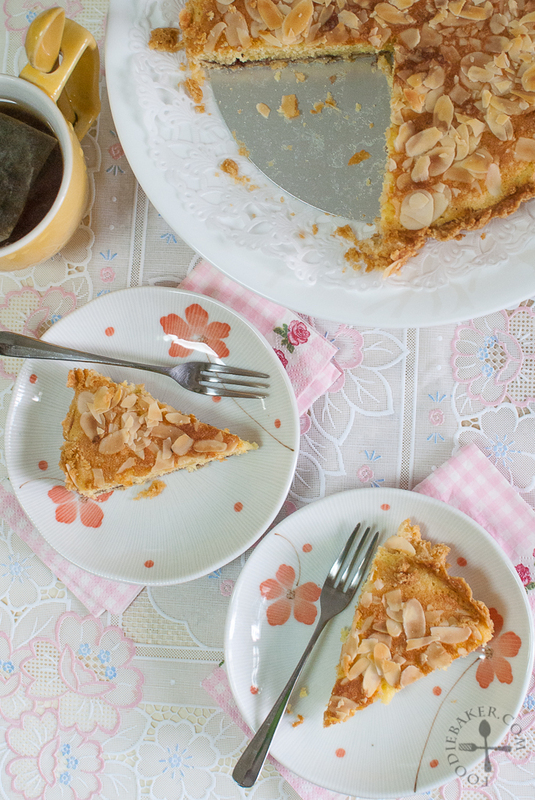 What a wonderful almond tart and it looks so delicious. Hope i have time to join this event and thanks for thinking of me too! Yummilicious! and love your Grandma! Congratulations on receiving the Liebster Award. It is very much deserved for you’ve taught me a great deal about both food and your travel destination. You write about both equally well. Thank you so much for nominating my blog, Jasline. It’s an honor and I appreciate your kindness. hi jasline, phew! glad to hear that it turned out well for you despite the wet almond paste and the soft dough crust. I do have that 500 pies and tarts book but i hv yet to tried the tart and as of lately, i realised that i actually lost that book! The dough from williams sonoma is pretty easy to handle i find. Thank you so much for sharing the award with me and i’m happy to know you too and happy baking along with you in thb and bake along! ..and that potato question…hahahha! I think your almond paste is quite wet but lucky that it didn’t affect the overall of your tart. That looks like an amazing tart recipe! Your blog was actually one of the first recipe blogs i had come across before starting one myself, and I wanted to tell you I really admire your dedication and passion for cooking and baking! Enjoyed reading this post as with all your other ones, and it’s so nice to learn more about you! Glad to have met u here! Congratulations on your award! And thank you so much for passing it onto me! Much appreciated! Your tart looks great! And this is one delicious tart! For the pastry crust, I find that if I left the crumbs in bigger pieces instead of “coarse sand”, and work in the water/egg yolk a little at a time, just until it comes together, do no overmix, makes the pastry easier for me to handle, it would not be as fragile and soft. But you got to work quickly! 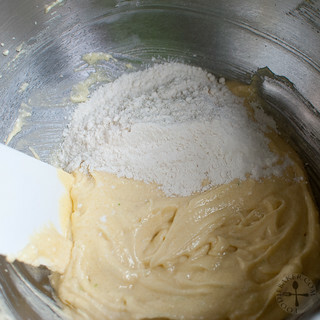 And for the almond paste, add in the egg white a little at a time, just until the paste can be kneaded to a soft dough. You need not use all of the egg white. And I have a couple of recipes lining up for “boozy month”! Congratulations on your award and nice to read your answers on those questions. And thank you so very much for thinking of me. Likewise, it is a pleasure knowing you thru your lovely blog!